What if you could answer a phone call with a single swipe along your arm? Imagine if your phone knew you were getting dressed to go out, and called a cab for you? What if it your jacket could automatically track your exercise as soon as you put on your running shoes? 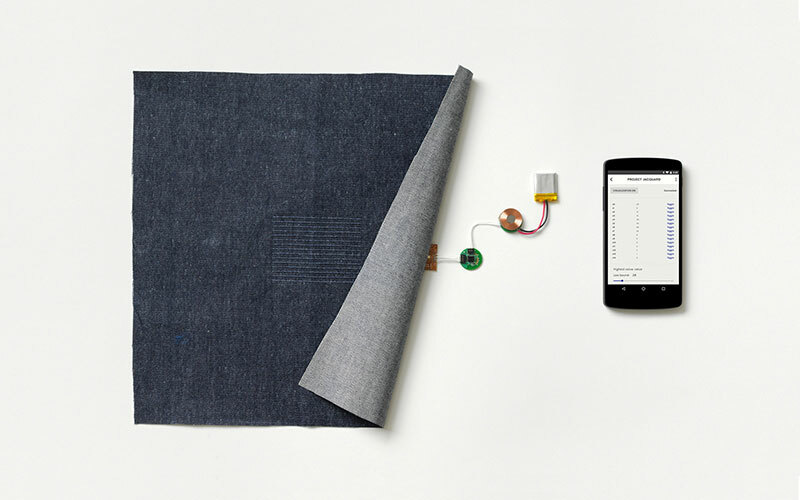 With Project Jacquard these simple actions can become reality, and everyday objects such as clothes and furniture can be transformed into interactive surfaces. Jacquard yarn is a conductive thread that combines thin, metallic alloys with natural and synthetic materials like cotton, polyester, or silk. This technology means that the yarn is strong enough to be weaved on standard, industrial looms, and is indistinguishable from the traditional yarns used today. The beauty of Jacquard allows bespoke touch and gesture-sensitive areas to be woven at precise locations, anywhere on the textile. They can be invisible or become a feature of the garment, and sensor grids can be woven throughout the fabric, creating large, interactive surfaces like a touchscreen. While the interactive surface may become a feature of a garment, the necessary electronics have been designed to be as discreet as possible. Innovative techniques attach the conductive yarns to connectors and tiny circuits, so the control device ends up no larger than the button on a jacket. These miniaturized electronics capture touch interactions, and various gestures can be inferred using machine-learning algorithms. LEDs, haptics, and other embedded outputs provide feedback to the user, seamlessly connecting them to the digital world. Jacquard is a blank canvas for the fashion industry. Designers with no knowledge of electronics can use Jacquard as they would any other fabric, adding new layers of functionality to their designs. Connected clothes offer numerous possibilities for interacting with services, devices, and environments, and developers will be able to connect existing apps and services to Jacquard-enabled clothes to create new features specifically for the platform. Poupyrev, I., Gong, N., Fukuhara, S., Karagozler, M., Schwesig, C., Robinson, K.
Fukuhara, S., Poupyrev, I., Paulos, E., Ryokai, K.